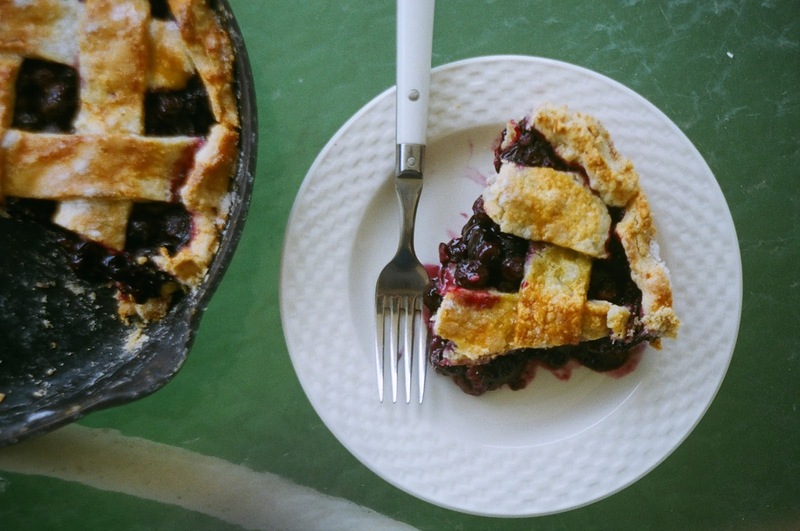 Blueberry pie has long had a place on 4th of July menus. It's an American classic, for one, particularly in the North. A recipe appears in Fannie Farmer's 1896 Boston Cooking-School Cook Book (though strangely calling for six de-seeded green grapes to improve flavor) and is the state dessert of Maine (though wild low-bush berries are the standby there). The timing also aligns-- the little blue berries (or blue bellies as I called them when I was little) generally ripen shortly after the first day of summer. 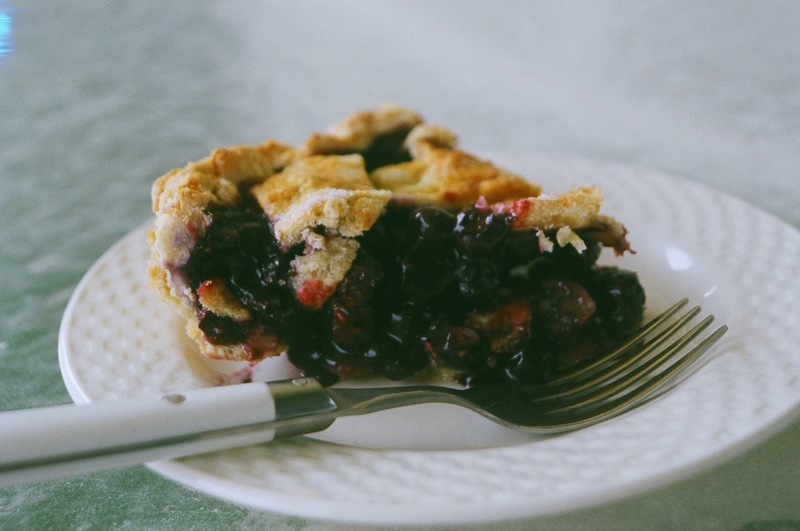 Food Timeline's 4th of July Food History, blueberry pie is prescribed on Good Housekeeping's suggested menus of both 1949 and 1955, in the latter to be served with "Spiced Sour Cream and Hot Coffee (instant)." 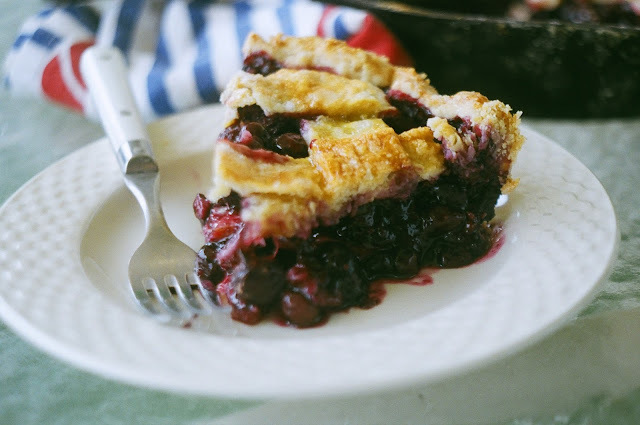 This year a deep-dish blueberry skillet pie found its way onto my 4th of July table. I spent the weekend on the beach in Ocean City, Maryland with my friends Elizabeth, Grant, and Chickpea the dog. Along with the pie, our Independence Day menu consisted of homemade pizza, American beer (some fancy, some cheap), and homemade coffee ice cream. We enjoyed it on the balcony amidst a 360 fireworks display while Chickpea took cover under the bed. 1. Prepare Nothing in the House pie crust as per the directions. After chilling the dough for at least 1 hour, roll out half of the crust and fit into a 9-inch greased and floured pie pan or a greased 9-inch skillet. Place pan and unrolled crust back into the fridge while you prepare the filling. 2. Preheat oven to 425 degrees F. In a medium bowl, combine berries, cornstarch, brown sugar, cinnamon, lemon zest, and salt. Stir together to combine. 3. Pour the filling into the pie crust and arrange so that its mounded slightly in the center. Sprinkle on the lemon juice. 4. 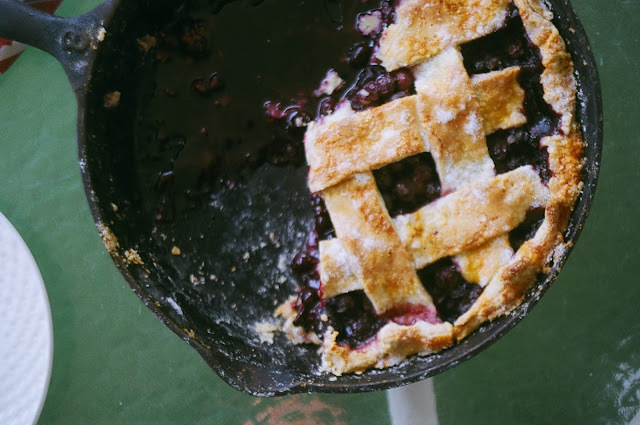 Roll out the remaining pie crust and cut and arrange into a lattice or crust design of your choice. Seal and crimp edges. Brush crust with egg wash and sprinkle with Turbinado sugar. 5. Bake pie on a baking sheet (this is to catch any drips) and bake for 10 minutes at 425 degrees F. Lower heat to 350 degrees F and bake 40-45 minutes more, until the crust is golden brown and the juices are bubbling throughout. Once baked, let cool on a wire rack for at least 30 minutes. Serve slightly warm or at room temperature.